At the beginning of this week I had the pleasure of taking part in a very informative series of teacher trainings during the ELT PEARSON Conference “Minds Wide Open”, which made me ponder on some of the points discussed, and re-position them in the context of the way we communicate today, using spoken language and the written word. I would like to share some of these ideas with you here, on the English Learners’ Blog. My thanks go to Mr JJ Wilson, and Mr Daniel Brayshaw for allowing me to use selected content from their presentations on this blog post. “It’s hard to recognise speech” was read by a computer as “It’s hard to wreck a nice beach”. Just the other day, while surfing my TV channels I heard a Polish lector translate the phrase “tuckered out” (exhausted, very tired, in the context “Oh, look at her, poor thing! She’s all tuckered out!”) as “delikatnie” (gently, soft). What separates people into listeners and good, or even great listeners? We all build temporary hypotheses while listening. JJ Wilson adds that, apart from that, good listeners test these hypothesis and learn not to take all utterances at face value. They know how to persevere in their attempt to understand in spite of the various parts of what they hear while listening that they do not understand. Good listeners are not as easily discouraged by the parts they do not understand, as the “all-or-nothing learners” are who lack nuances like: “I did not understand this part, but I did understand…”. It is also essential to understand the speaker, not only the words & sentences in use, because, as real-life contexts often show, that is not always enough. In understanding the speaker, the good listener makes use of both his linguistic and his worldly knowledge, such as the conventions of turn-taking, or interpreting speech as relevant to a status or position of power, and so on. A good listener focuses on the important facts and ignores anything else. Before proceeding to the list of listening strategies proposed by JJ Wilson, let me redirect your attention to a project called “Say Something Nice”, initiated by ImprovEverywhere, as part of the Guggenheim Museum exhibition stillspotting nyc. Speaking for the sake of saying something nice sounds like a pleasant premise for listening, doesn’t it? Watch the video and decide for yourself what you would say if you had to… say something nice. Have you heard of Blaving? It is the new vocal social network. On the Discover Blaving page of the site you can find out how to record your first blav, how to upload an existing audio file from your computer, how to send invitations to your friends from Facebook, to your twitter followers, or link your account with Facebook or Twitter. The English coursebooks in use today have already incorporated email writing and text messaging. I wonder how many more new media and social networks will be featured in next year’s editions of the same coursebooks we use today. Whatever the changes, the world will always need good listeners. Take a look at the JJ Wilson’s list of listening strategies below and see how many of them you are using while listening. Is there anything you might want to add? 5. Are experts at self-monitoring. 6. Tolerate ambiguity and persevere. 7. Question the completeness of their understanding. 8. Identify specific problem areas. 11. Focus on what is valuable. 12. Listen to different things in different ways and ignore anything else. At the end of the 50-minute training session I was testing my own abilities of using these strategies while listening and realised that the presentation title corollary is equally valid: great listeners need great speakers, which JJ Wilson most definitely was. Attending sessions like his is one of the reasons why I love ELT Conferences. The last session of the day, “Getting Writing Right” by Daniel Brayshaw, focused on the re-integration of writing into the space of the English lesson from its common-place exile in the “homework assignment” area. Another focus of Daniel Brayshaw’s presentation was the reality of the writing process. Students should be directed towards writing to real audiences and writing with a real purpose. Example of potential recipients of the students’ letters could be Universities, NGOs, singers, actors, sport players, or even Government institutions. Sending messages that are relevant reflections of the students’ aspirations, communicative goals or creativity are essential activities for the improvement of their writing strategies and skills, as well as for the style and register approached. The same quote JJ Wilson used in his sessions could be applied to Daniel Brayshaw’s presentation: people do not only construct their speech in order to get something, but they also write in order to obtain something. One of the initial questions asked during this presentation was: What do we write? The top answers, as you can imagine, were emails, text messages and Facebook statuses, closely followed by notes, post-its, blog posts, essays, articles and exams. What about hand-written letters? the question rose around me. We did not get into the topic of letter writing, much less into letter hand-writing, as this topic fell outside the focus of Daniel Brayshaw’s session. On the same day of the Conference, however, I happened to come across an article in The New Yorker magazine about the rise and fall of the US Postal service as it was captured in 14 New Yorker magazine covers from 1927 until now. The article was posted by Mina Kaneko and Françoise Mouly. Its content is summarised below, in this last part of my post, under each cover of the magazine, which leads me to other reasons why I love ELT Conferences: namely for what happens after these conferences, for the associations triggered by the sessions and, last but not least, for the connection with other ELT professionals sharing their passion about learning, teaching and some of their multifarious aspects. of the postal system to the remote countryside. Rural delivery became a permanent service in the early twentieth century, and personal mail receptacles were required for delivery by the twenties. the postal service was their only link to family, loved ones—and money orders. In 1955, even city folks’ schedules still revolved around the mailman’s last pickup. the downpour of mail-order catalogues was a rite of fall. In 2001, the volume of first-class mail reached its apex, at ten times its 1925 level, and 2006 was the peak year for all classes of mail combined. Glamour, Blog Stats Review & a Verry Happy New Year! With this first post of 2011, I salute you, dear English learners and blog visitors, and wish you a very happy New Year, filled with the motivation and inspiration that you need to keep moving forward in learning, growing, loving and enjoying LIFE! Today, January 17 (European time), the sun shines nostalgically upon the glamorous LA Golden Globes ceremony, as well as upon another important event, the 4-day NAMM show. For more details on this year’s Golden Globes winners and their speeches, follow this link. The big winner, The Social Network movie, won four awards, including the best motion picture drama. What you are about to find out is that the same movie, or its source, Facebook, prospectively, indirectly and additionally won the gratifying attention of this blogs’ visitors in 2010. As you can see in the English Learners’ Blog stats summary tidbit below, the post which attracted most comments from you in 2010 was the one on Mark’s Zuckerberg’s Open Letter to the Washington Post concerning Facebook and its growing affluence in today’s societies. In 2010, you wrote 49 new posts, not bad for the first year! You uploaded 70 pictures, taking up a total of 41mb. That’s about 1 picture per week. Your busiest day of the year was June 8th with 420 views. The most popular post that day was Open Letter to the Washington Post. The top referring sites in 2010 were poczta.o2.pl, facebook.com, poczta.onet.pl, poczta.interia.pl, and zalacznik.wp.pl. Some visitors came searching, mostly for hyena, red fox, beluga, fox cubs, and redfox. 3. On-line Profile: What do my students have to say about me? To many more posts and comments in 2011, I say, and, before waving you a graceful goodbye, I would like to invite you to read my latest article on blogging, enclosing and summarising – this time in an objectified, yet personal rendition – my blogging experience with the English Learners’ Blog throughout 2010, in the December issue of The Teacher magazine. The magazine is still available in Empik stores throughout Poland. I’ll do my best to provide you with online copies of this and other published articles in due time. My thanks for successful blogging and learning in 2010 go to my students, without whom this blog would not have taken off so smoothly, to my peers and mentors for their support and passion that I did not fail to notice throughout my teaching and learning years in Romania, England and Poland, to Ms Malgorzata Swiatek, director of the Jagiellonian Language Centre, for allowing me to cross new borders and manifest my creativity in teaching Jagiellonian University students since 2006, to Ms Ela Kwiatkowska, editor-in-chief of The Teacher magazine, for her trust and support of my metaphor-bound vision in teaching, to all the great teachers and musicians I met during my stay in India at the Swarnabhoomi Academy of Music between October and December 2010, and, most reverently, to Atma Anur for his unique insights into learning, living and loving the world. May we all enjoy an inspirational New Year, 2011 times happier! 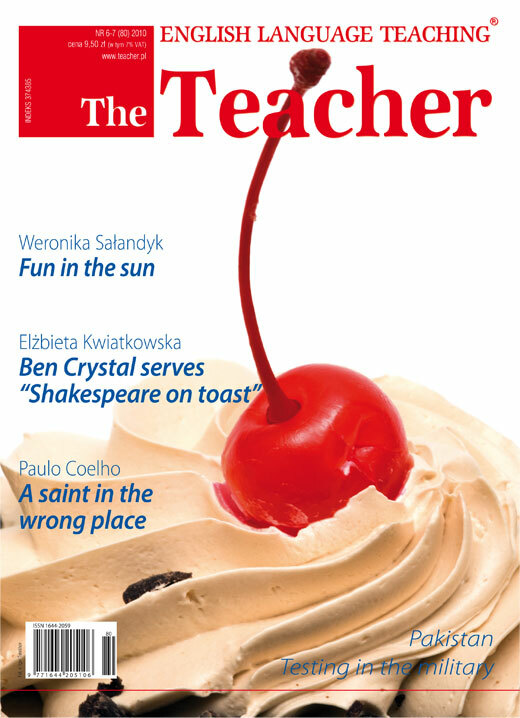 Yes, You Are in “The Teacher” Magazine Again! Students for students, measure for measure. I will let you know as soon as I post online versions of the the “Additional Learning Sources” series on one of my sites. If you wish to keep an eye out for latest news, hit the SIGN Me Up button on the right-hand column on this page. Enjoy the summer, and keep coming back! Exam sample papers soon to be posted right here, on the ELB!